LEN - www.lankaenews.com | UNP to form separate govt. but can it forge ahead with a deadly enemy - the president around ? Karu is P.M. ? UNP to form separate govt. but can it forge ahead with a deadly enemy - the president around ? Karu is P.M. ? (Lanka-e-News - 12.Feb.2018, 11.00PM) A discussion chaired by the UNP leader was in progress at UNP headquarters –Sri Kotha to form a separate government. The president who agreed to continue with the consensual government yesterday (11) ,however through his media divisions released a communiqué that he did not concur in such a view when he heard the UNP is holding discussions to form its own government . 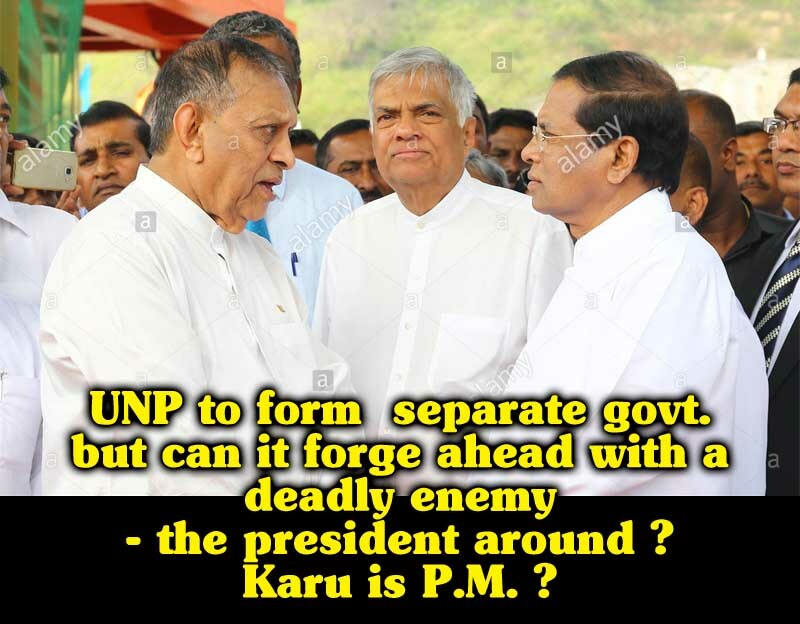 A majority of the UNP members had decided that since the SLFP faction of the consensual government did not work in accord with the consensual agreement they cannot go any longer with them , and it is the request of many that the prime minister post shall be granted to Karu Jayasuriya. However Malik Smarawickrema and Sagala Ratnayake have opposed that. Though they did not wish to openly state , a majority of the UNPers are in favor of Ranil Wickremesinghe stepping back. It is the view of some others , UNP trying to form a separate government is not practical . This is because the president who conducted himself against the UNP during the consensual government can turn hostile when the UNP forms a separate government ,and he is sure as the chief of the cabinet going to turn antagonistic openly to scuttle all the UNP proposals . President Sirisena by now has confirmed beyond any trace of doubt and umpteen number of times he is a most virulent enemy who could from within destroy the UNP , while his other group to whom he went on all fours prior to the elections could attack from outside. It is therefore the opinion of some other UNP stalwarts, that it would be difficult to form a separate UNP government and forge ahead amidst such venomous enemies . It is learnt the UNP has still not discussed with the JVP in connection with the party forming a separate government . There are 105 UNP members who contested under the elephant symbol , and they require only another 8 to make it 113 to form a UNP government. The request of the Rajapakses is to dissolve parliament and call for elections. This will not be practical since this was an election held for local bodies. Besides that could create a pernicious precedent. If each time after the local body elections or a provincial council election the parliament is to be dissolved , it would not be possible to run a stable government in that country . Meanwhile , the Rajapakses who polled 44 % of the votes as against the government which polled 46 % ,cannot demand dissolution of parliament , and call for elections . Instead what they should demand is the resignation of the president whose vote base fell to as low as 4 %, and demand a presidential election . ( If the president resigns the law must resolve the issue whether the speaker will become the president until his term is over ,or a fresh presidential election shall be held).